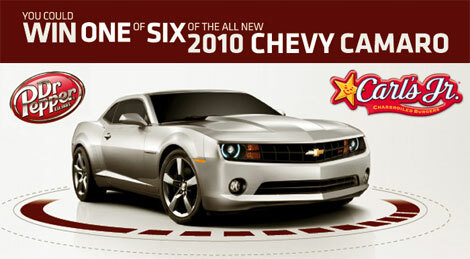 Starting today (6/24/09) you can enter to win one of six 2010 Chevy Camaro's from Carl's, Hardee's, and Dr. Pepper. I don't know why I'm spreading the word. I'd kinda like to win one myself. Heck, they sent me a pineapple, how much more is it to ask them to send me a Camaro? Anyway, you can enter at www.DrPepperCamaro.com and when you do you'll get a link to a coupon that will upgrade your Medium Combo Meal at Carl's/Hardee's to a Large Combo Meal for free. A car!!! this is like my second one I entered today first babieebabiee.blogspot.com with sephora products an this one which is waaaaaaaaay better than the sephora!